Let’s face it, dogs have been going places with their humans a log longer than cats have.  So most of the gear we use for going places with our cats is adapted from dog gear. Some of it even is actual dog gear, complete with doggy logos. People think the cupcake-themed patches on her gear are branding, but they’re really to hide the dogs! Anyone who has a cat knows a cat isn’t actually a little dog. They think differently, they behave differently, and they’re shaped differently. 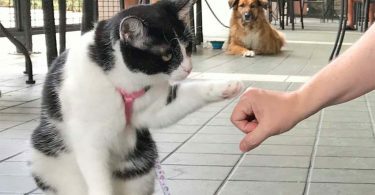 Cats are longer in the body compared to their height than most dog breeds, so using a harness originally made for dogs usually results in a not-quite-right fit. Cupcake’s old soft harness, which is a dog product, rides up under her armpits in a way that makes her uncomfortable after a while. 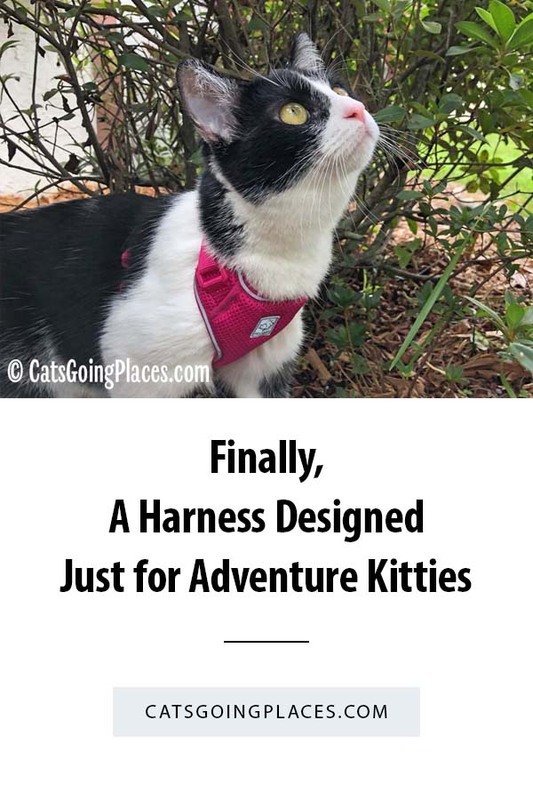 So when I heard that RC Pets was designing an adventure kitty harness for cats, I was really excited. 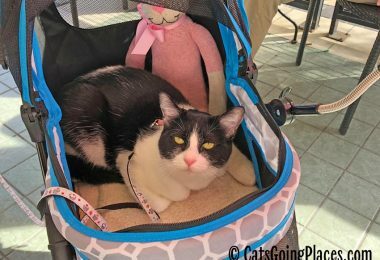 I talked to them at Global Pet Expo in the spring and saw a prototype, and as soon as I saw it, I could see how much longer it was than Cupcake’s current harness. It was clearly built with the longer body of a cat in mind. 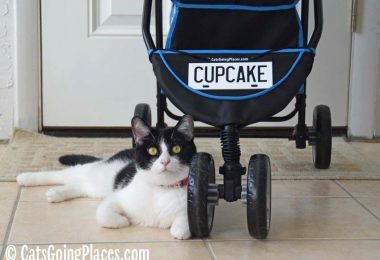 To get an early adventure kitty harness to try out, RC Pets asked me for Cupcake’s measurements. 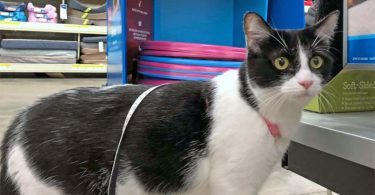 I was surprised when they told me that her measurements put her in a medium harness. “Are you sure?” I asked dubiously. Cupcake a little over 8 lbs, and every harness I have bought for her until now has been an extra small. I had to remind myself that all of her harnesses until now have been in dog sizes, and it wasn’t until now that she had a chance to have a harness that was sized properly for cats. It’s a different mindset when you measure her among cats instead of among dogs! The harness has a nice, soft breastplate made of air mesh with reflective binding around the edges. The rest of the harness is made of sturdy 3/8″ webbing. This is wider than the webbing I was used to using for her harness, and my initial thought was it was going to look huge on her. It doesn’t, though. I quickly discovered that the wider webbing helped the harness straps lay flat much more easily, and I was less prone to trying to twist them when I put the harness on her. You can see how the longer breastplate on the harness allows the harness not to ride up under Cupcake’s armpits. That’s a big win for her comfort. The harness comes with a matching, 6 foot leash. That’s a big win, because I would have spent a lot of time trying to find a leash to match or complement the gorgeous raspberry color of the harness. It’s pinker than Cupcake’s nose! I really like the 6 foot length of the leash a lot, so when I’m working with her in a safe area, I can use the full length, and when I need her close beside me, I can hold the leash shorter. The leash attaches to the harness with a sturdy D-ring that is positioned at the very back of the harness. I also attached Cupcake’s ID there. With the harness being so long, it feels kind of awkward to attach something that far down her back, but it hasn’t turned out to be a functional problem at all. 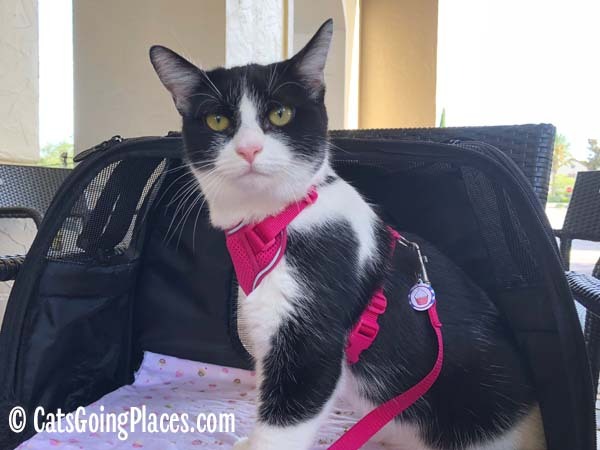 In fact, the only functional problem we have run into at all with the harness had to do with the fact that Cupcake is less of an adventure kitty than a couch potato. When we are out on our regular outings to the coffee shop patio, she tends to lounge around on her side or back, and I found that the breastplate gapped then in a way it didn’t when she was standing up. That made sense, since she was rolling around and being generally goofy, which curled her spine much more than when its straighter position when she is standing up. At one point, while lounging around, she managed to slip her front paw inside the harness, which illustrates how the elongated harness doesn’t sit flush when she’s laying down. 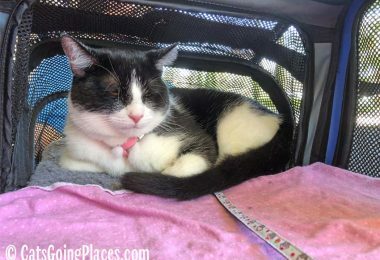 This is only possible when she is lounging around in a semi curled up position, so it would never happen during regular cat adventuring, and it wasn’t really a problem. Just a bit of a surprise to both of us. 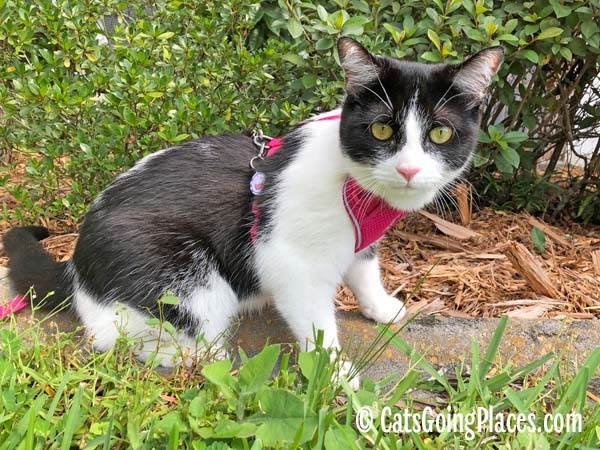 The harness really shines for cats who are upright and sitting, standing, walking, or climbing. Cupcake put it to the test, trying everything from walking in the pet store to climbing the tree in my front garden. It performed really well, and she was comfortable enough to go nonstop while chasing lizards around the garden until she wore me out! 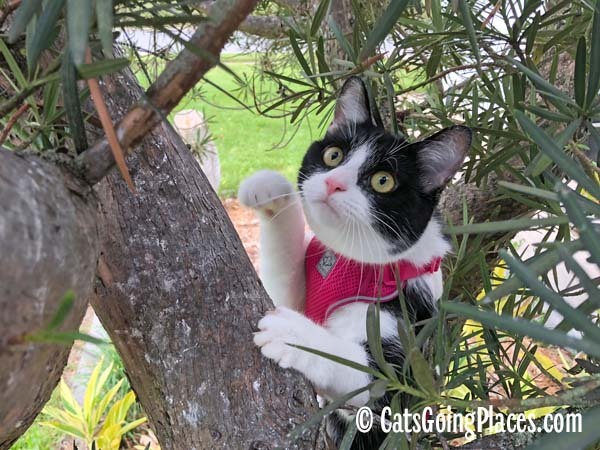 Cupcake gives this harness paws up. All the way up the tree! I really like it, too. 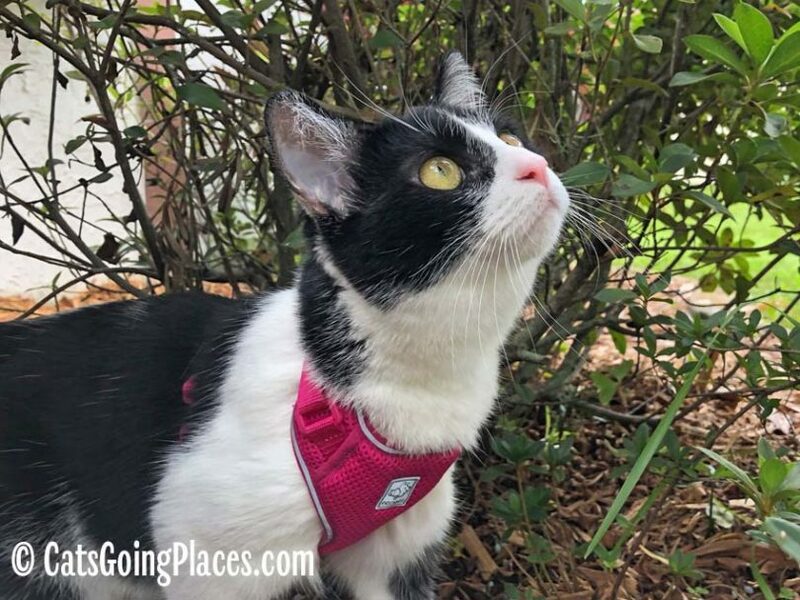 It’s a sturdy, safe, and fully-adjustable harness for any cat on the go, especially one who is an active adventurer. 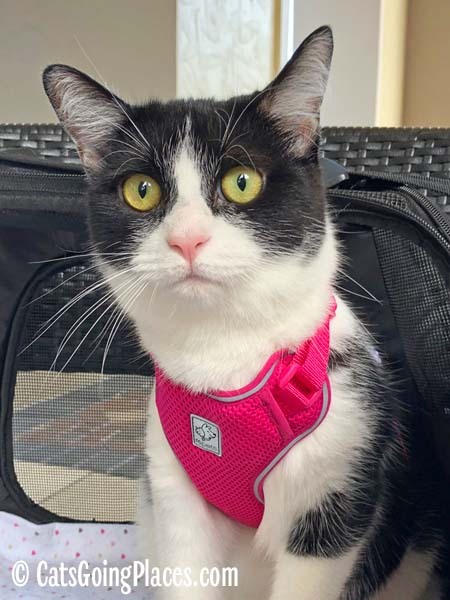 You can get the RC Pets adventure kitty harness at Amazon in raspberry pink, teal blue, and black. 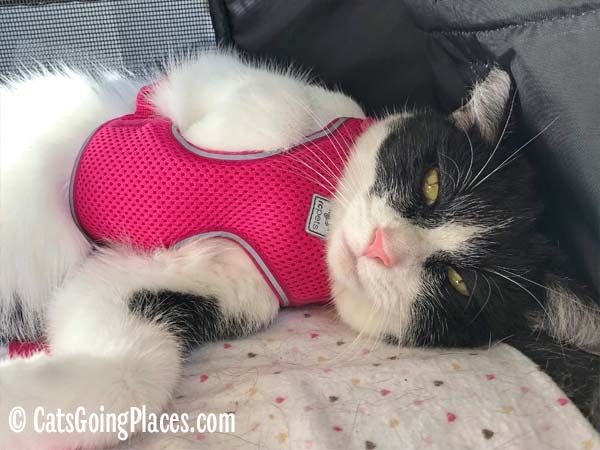 FTC Disclosure: I received the RC Pets adventure kitty harness for review at no charge. This didn’t influence what I said about the product. All opinions in this review are my own and not influenced by any outsider. I receive no additional benefits for talking about the products or company. Yay for a company making CAT stuff for cats!!! I love that it is made for cats but will someone please make a really small one for training kittens to the harness?